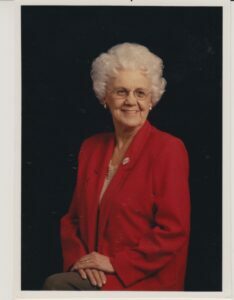 LEWISTON - Muriel A. Begert, we lost the light of our family, our Mom, our Memere, on Feb. 8, 2019, at the age of 96. LEWISTON – Muriel A. Begert, we lost the light of our family, our Mom, our Memere, on Feb. 8, 2019, at the age of 96. Born in 1922, Muriel was the youngest of a family of 15. She was born, raised her children and passed on at the family farm surrounded by her cherished family. Mom loved her family from the depths of her soul. She always wanted children and the family she created remained the focus of her entire life. She was a terrific mom to her five children and fierce advocate for her grandchildren and great-grandchildren. Her grandchildren and great-grandchildren adored her. Her love drew the family to her every weekend, filling the house with sounds of children’s laughter for decades. Mom had a magical way of reaching in and touching people, whether she knew you or not. If you met her, you were her friend. Mom’s language was love. A visit with mom or memere always left you feeling valued, lifted up, and usually lighter with laughter. Mom loved to laugh. And this included at herself. She often told of going to a cocktail party with dad, completely intimidated and nervously chatting up some businessman while unknowingly dunking her pearls in her cocktail the whole time. Mom always bemoaned her lack of education. And yet, she was the smartest person we knew. Her intelligence was rooted in common sense and a desire to connect. Because she operated from emotional intelligence, extremely intuitive, she had a keen baloney barometer. She could read her children and grandchildren and would soon extract whatever day’s concerns or pain and soothe them. Mom was active all her life. Her enduring love, her passion, was dancing. She often spoke of the dances she attended at city hall with her chums, walking home miles with shoes in hand, feet sore and heart full. If there was music on – a polka or waltz – and there was room to move, she was dancing, often grabbing anyone within reach to join her. Mom met and married dad, Charlie, working in the Pepperill Mill. They married in 1950 and went on to have five children. She leaves behind her sister-in-law, Amy Ashton; her children, Kathleen, Mary, Jan and wife, Alyson, Frank and wife, Catherine, and James. She also leaves behind her grandchildren: Elizabeth, Rebecca and husband, Paul, Jennifer and husband, Matt, Julie and Eli. And finally, her beloved great-grandchildren: Evan, Heather, Jack, Bella, Karson, Collin and Tialyanna. Muriel was predeceased by her husband, Charles; six brothers: Eddie, Willie, Alphee, Romeo, Laureat, Lionel and three sisters: Blanche, Carmen and Yvonne. With full hearts, the family wishes to thank Dr. Kappelmann, Barb and Jane for the excellent and compassionate care they gave mom for over 20 years. We, including mom, often spoke of how fortunate she was to have you in her life. The family also wishes to thank Androscoggin Home Health and Hospice for the wonderful support and care of mom during her final days. You are invited to offer condolences and pay tribute to Muriel’s life by visiting her guest book at www.thefortingroupauburn.com. Visitation at Fortin Auburn, Wednesday, February 13, from 4-7 p.m. A Mass of Christian Burial, February 14, at 11 a.m., at Holy Cross Church. Arrangements are under the care of the Fortin Group/Plummer & Merrill Funeral home, Cremation & Monument Services, 217 Turner Street, Auburn.